At Bookmans, we live by a tried and true adage, geeking out is half the fun. Some may argue that geeking out is a little more than half, or perhaps all, of said fun. But we can all agree, it’s a major part of the fun. This May, we are dedicating all of our forces to the celebration of of superfans everywhere. Whether your love is for comics, sci-fi, tech gadgets, star gazing, serious crafting or just curling up with a great book, Bookmans has you covered. Engage in dynamic events at each Bookmans location and in the local community from Star Wars shindigs to the Signature Pop Culture Event of the Southwest. Our event calendar has something for everyone. 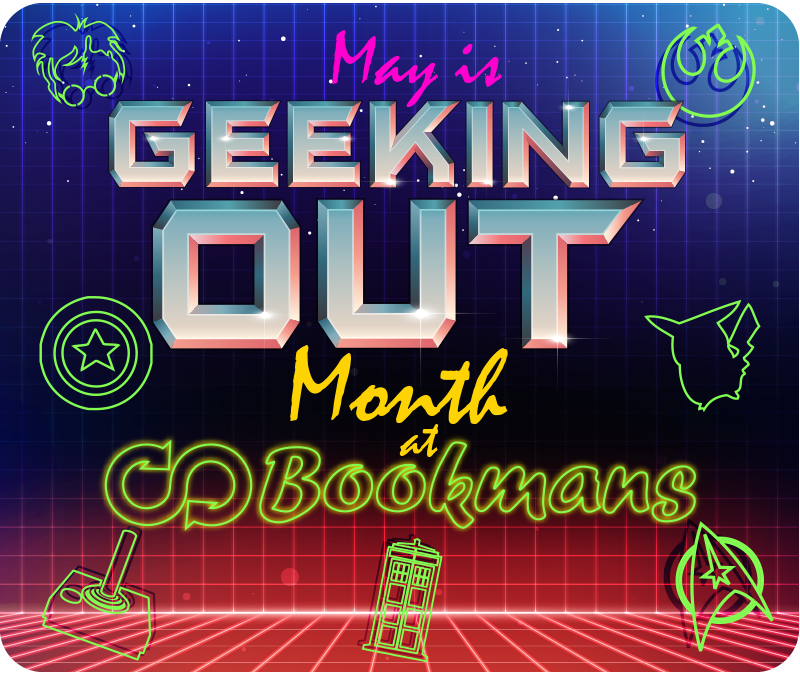 Head to your nearest Bookmans this May and let your geek flag fly! Bookmans Phoenix is going full Rebel Legion with Star Wars: Revenge of the Sixth featuring a plethora of galactic activities, prizes and 25% all products! Also in Phoenix, get in the game at Controllers & Canvas featuring local artists and pop culture awesomeness. Don’t miss the great and almighty Phoenix Comicon from May 25th through the 28th at Phoenix Convention Center. Bookmans Mesa is pulling out all the stops with the Great Geek Giveaway In-Store Contest! Come into the store and enter to win an amazing prize pack – that gathers new loot each day in May. Also in Mesa, celebrate May the Fourth all day long with exclusive random Star Wars swag giveaways, trivia, and (of course) books at Reading. It’s Our Only Hope! And don’t miss an exclusive Special Edition Storytime taking place in A Galaxy Far Far Away! Bookmans Flagstaff unites the nerd-tastic community with a weekend of awesome superhero themed animal adoptions at Be A Hero Animal Adoption Day! Meet your new best furry friend and take photos in the Super Hero Photo Booth. Bookmans East is getting in the Star Wars groove with Revenge of the Fifth celebration! Party with the Star Wars 501st Rebel Legion and meet the one and only Chewbacca! Also at Bookmans East, clean up on comics at the Free Comic Book Day After Party and get your game on at the Game-A-Palooza. Bookmans Midtown hosts the Revenge of the Fifth: Star Wars Movie Night that’s sure to be fun for the both Rebels and the Empire! Also at Midtown, geek out with TechDivas & DigiDudes featuring friends from UA’s Eller College who will be showing off all the latest & coolest gadgets and toys. Bookmans Northwest celebrates Free Comic Book Day with fun activities and giveaways. Also at Bookmans Northwest, join all the video game fun with Super Smash Bros. & Melee Tournament. Whether you’re a tech wizard, a master of the force or a dark knight, we encourage you to get your geek on. Find the droids you’re looking for this May at Bookmans. For more information about what’s happening near you, take a look at our Events Calendar.